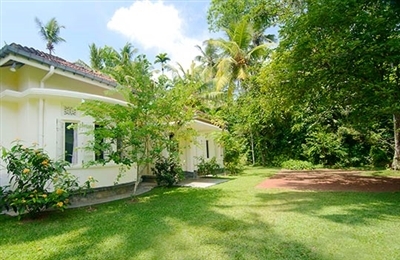 Des Indes Villa II is a hidden gem! From the moment the bright red iron-studded entrance door swung open to reveal a row of saffron-robed stone-carved monks standing sentinel across the entrance pond, we were enchanted. 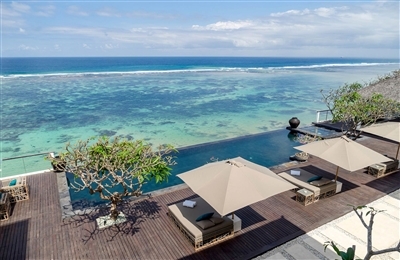 The clever layout makes the most of the space – land is at a premium in this uber-elite part of Seminyak, and we liked the way both (surprisingly large) bedroom suites were separated by the swimming pool, giving extra privacy. The owners have a fine eye for Asian antiques and artefacts, and we loved the blend of heritage romance and modern luxury… where else can you take a bath surrounded by Chinese porcelain and Asian artefacts! Favourite places to hang out? The huge four-poster bed swathed in mosquito netting, and the elegant marble-topped breakfast table by the pool. The staff greeted us with garlands of Frangipani flowers and refreshing ice-cold towels, and a special mention must go to the chef; his beautifully cooked Barramundi dinner made me so happy we chose to eat in rather than stroll down to La Lucciola! We were one couple staying, and think this would be a rather lovely honeymoon spot; but imagine two couples or a family with two kids would be equally happy here. 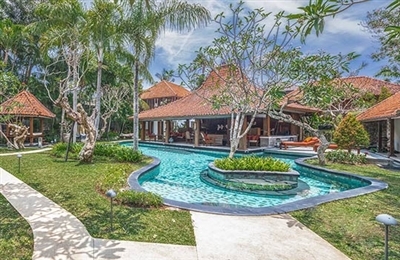 If you’re looking for a luxurious destination villa, with spectacular views and true sense of space, where you can escape from everything and spend time with your family or friends, then this is the villa for you. With its attentive-yet-discreet service and every recreational facility at your fingertips, a 43-inch satellite-channel TV and Blu-ray DVD player in every bedroom, three different dining areas, and an abundance of comfy spaces and places to hang out, you can be together as a group or veer off on your own. In fact, with three floors, the villa is so big that you’ll lose each other within its depths. Most of the outdoor space is taken up by the pool and the massive pool terrace, which is wonderful for big groups, but we felt that it wouldn’t be so good for kids who want to run around kicking a ball. However, teenage kids (and adults) will love the games room, the bar, the karaoke and the abundance of TVs. We certainly did!